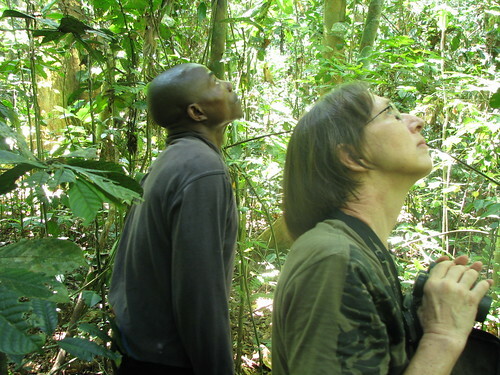 Searching for Bonobo in Congo » A House filled with laughter up the Lomami. Of Laughter, there is an abundance. Of Happiness? The women grabbed our red plastic chairs and heaved us up over their heads. We were marched about like queens in the cheering throng. 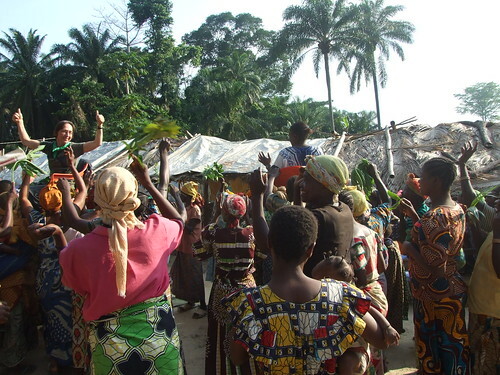 Our dugout had barely landed in Obenge when the women of the village came dancing and singing to greet us. They surrounded me and the Mama A.T. where we were sitting in the plastic chairs that we had just carried up from the dugout. The chairs were lifted again, this time with me and Mama A.T. in them. And the women carried us around over their heads, singing and dancing the whole time. Quite the enthusiastic greeting ! I guess we were almost unimaginable to them: two women who represented authority, state authority and project authority. Something for the village women to dance about! From the start, it was the women of Obenge who interested me the most. In some ways they are so strong and determined, in other ways so powerless. Madawa holding her nephew, Washi’s, son. 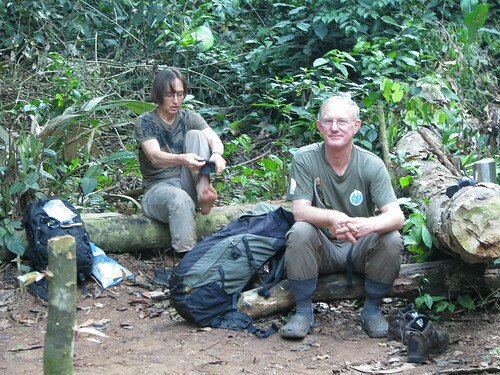 John had a joking relationship with Madawa, the woman who managed the Losekola primate camp. As we hiked out to the camp she and John were constantly teasing each other “Ahh, Madawa I think I dropped some money would you go back and find if for me” “If you dropped any money it is already in my pocket and you won’t find it again.” She had an irresistible smile. At Losekola we ate her food and drank the water she carried. We arrived exhausted in camp in the late afternoon. Madawa, who walked out with us, prepared hot bucket baths, fetched drinking water and heated supper. A fine woman of great stamina. I was eager to get to know her. We could communicate in simple Swahili and she also spoke some broken French. Kinyamituku was her native language. 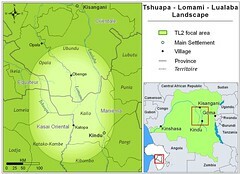 She and all of her family came from the north edge of TL2 – between the Lomami and the Lualaba. Not surprisingly, as I ask her about herself, it is “her men” she wants to talk about. She points out her son in a distant field as we return to Obenge from the Losekola primate camp. He is now almost 20 and it is he (she tells me several times) who built their house that she proudly shows me. 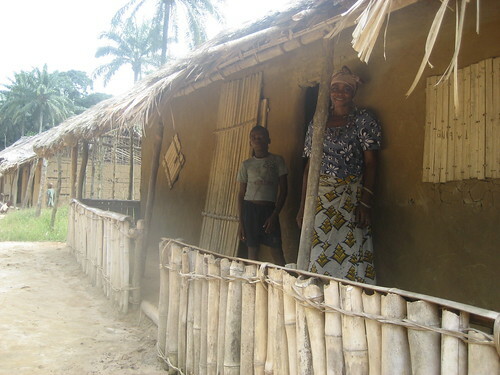 Madawa in front of the house her son built. And who were the other people living in the house? Willy Conader closing up camp at Losekola. 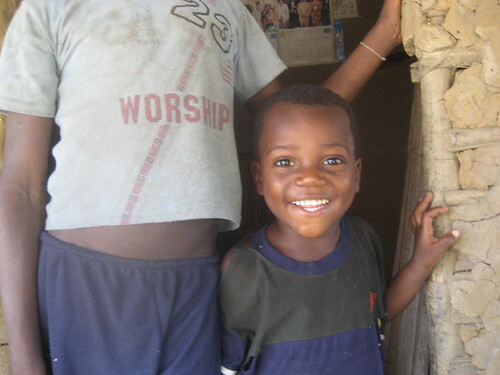 He and Washi stay in their Aunt’s, Madawa’s, house. Conader. Remember Willy Conader? His wife was stolen by the Maimai and his youngest son died a couple months later in “captivity”. Conader is the nephew of Madawa. 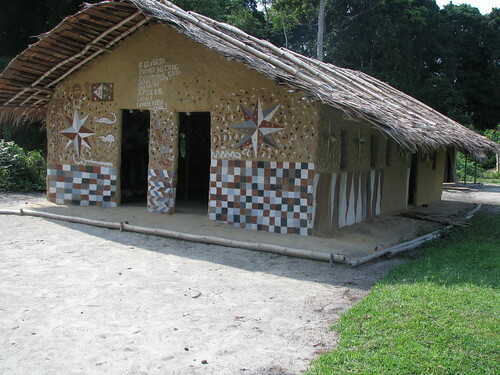 Like her he is of the banyamituku ethnic group and born in the village of Kobekobe further east in the forest towards the Lualaba. Conader works hard to please Ashley and John. His goal is to earn enough money to bring on another wife so that he can reclaim his two older surviving children, a girl and a boy. Now they are in Kobekobe with Madawa’s brother. Conader helping me search for primates in the forest canopy. Washi. 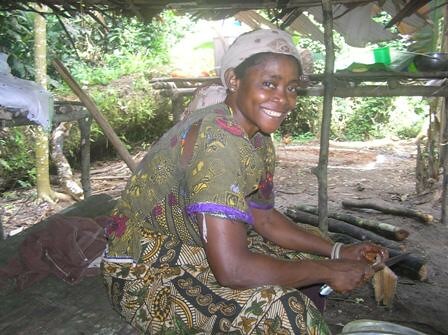 Washi, another porter with the project seemed the happiest of Madawa’s family. He too is a nephew of Madawa but his wife and children are living with him in Obenge. 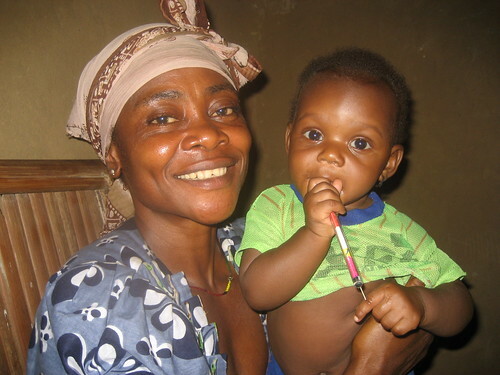 Washi lived with his wife and baby and delightful son, below, in Madawa’s house. Most living happens outdoors so not much room is needed indoors, just a space to sleep. It was Madawa’s own story that I really wanted. When their son was just two years old, Madawa’s “husband” left her near Kobekobe and came with their son to Obenge. It was his right. The children belong to the husband. 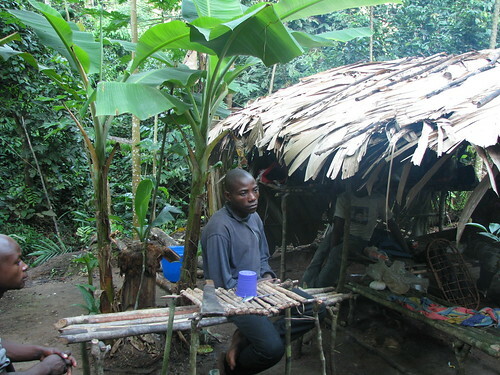 He was a bushmeat hunter but when the boy was barely ten years old his father died. 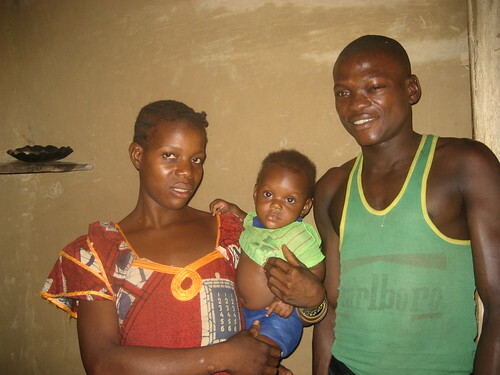 Madawa got the information and immediately came to live with her son. Together they built the house where they now live. The painted church in KobeKobe where Madawa was born and where she waited until she could rejoin her son in Obenge. This almost seems like a story with a happy ending –except, according to Madawa: After the Obenge massacre of 2001, at which time Madawa and her son had managed to flee into the forest, they were left with absolutely nothing. Dracula took or destroyed everything in every house in the village. Then Colonel Thoms came and he was the “colonial” master of Obenge. All the young men worked for him including, of course, Conader and Washie. Left to himself, Conader quickly becomes pensive, never sullen but rarely jovial. Now maybe things will change. Even if it is only slowly. Madawa laughs and hugs Wahsi’s son, Sahive. I hope it is a justified optimism. We all like happy endings, and how could fate resist a smile like that?? Madawa in the Losekola kitchen. There is always hope where there is a smile like this. This entry was written by Terese Hart, posted on 2008-06-08 at 10:27 pm, filed under About the project, Bushmeat. Bookmark the permalink. Follow any comments here with the RSS feed for this post. Post a comment or leave a trackback: Trackback URL. Indeed. Ordinary folk in extraordinary circumstances, and still with a smile on their faces. Amazing. Loved the first pic with the Obenge “chair ceremony”! I hope many wonderful changes are coming with the bushmeat trade going down and not up — I pray you can educate and help this family to further their story and help the wildlife while helping themselves. It is time for that! Conservation for some important part of the TL2 with all the animals in it and a better life for the people who have been living on the edge — TL2’s edge — for generations. First and critical protection has got to be for bonobo, elephant, and okapi. If we can get that idea across the idea of hunting management is introduced. Ashley has moved further south in the landscape. SOO, perspectives from the south soon.